Like the style conscious owners of this outstanding Sunset swimming pool, your lifestyle aspirations form the key that determines Sunset’s individualised pool design philosophy. This property’s original pool fell short of the homeowners ideals following the redevelopment of their elegant new residence in Sydney’s inner west. Sunset’s design solution incorporated the family’s desire for a pool that mirrored the high standards and quality finish of their new house, incorporated a generous seating and entertainment area and a large shallow beach for their children. Framed by the building’s expansive floor to ceiling windows the view of the pool through the semi-frameless glass enclosure forms the focal point for each of the house’s formal and informal ground floor living areas. The important relationships between the living, outdoor recreational and entertaining areas are key to this redevelopments obvious success. When your existing swimming pool no longer reflects your sense of style, discover how Sunset Pools will replace, update or restore your aging asset. Telephone Sunset on 1300 000 412 or complete the enquiry form today. 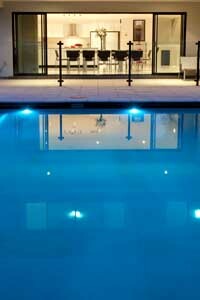 Sunset removed the original pool and patio entirely and coordinated site excavation with the development’s builder. This was done to make certain that each of the finishes’ specifications as well as the practical drainage falls were considered to ensure a consistent level and that a flawless indoor/outdoor flow was accomplished. Although it appears to be a traditional in ground concrete construction this significant 9 meter x 6 meter pool is almost entirely elevated and supported on piers. Achieving the desired level living environment mandated excavating back to rock and then re-establishing a new level exterior that would marry with the house. In addition to a deep shell, a 7.5 meter long beach and multiple support columns, the pool’s sophisticated engineering includes moisture barriers for retaining walls and structural support for the vast floating deck that extends from the property’s boundaries to the house’s perimeter. Meticulous attention to detail matched the paved stone surrounds with the home’s floor finishing and colour coordinated the pool’s ceramic mosaic waterline tiles with the building’s contrasting modern detailing. 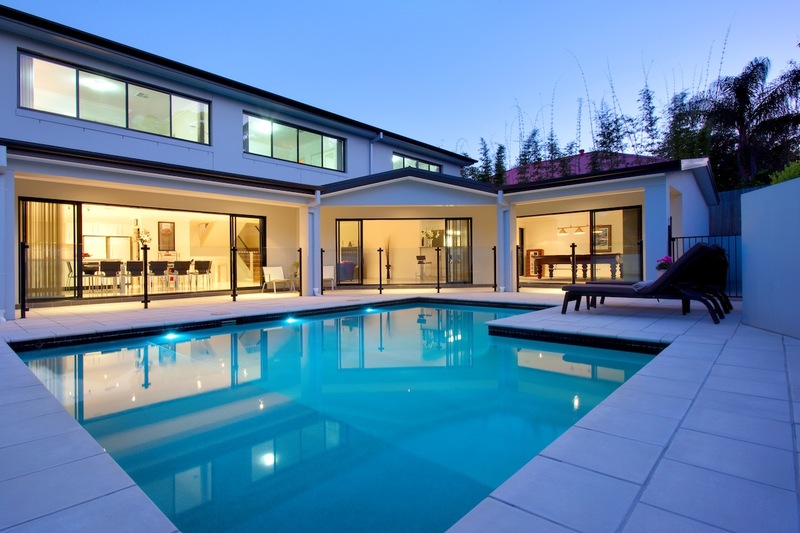 The cool contrast of the Sunset Samoan blue interior sets off the warm tones of the natural stone surrounds, fulfilling this family’s dream for the ultimate Sydney leisure lifestyle. 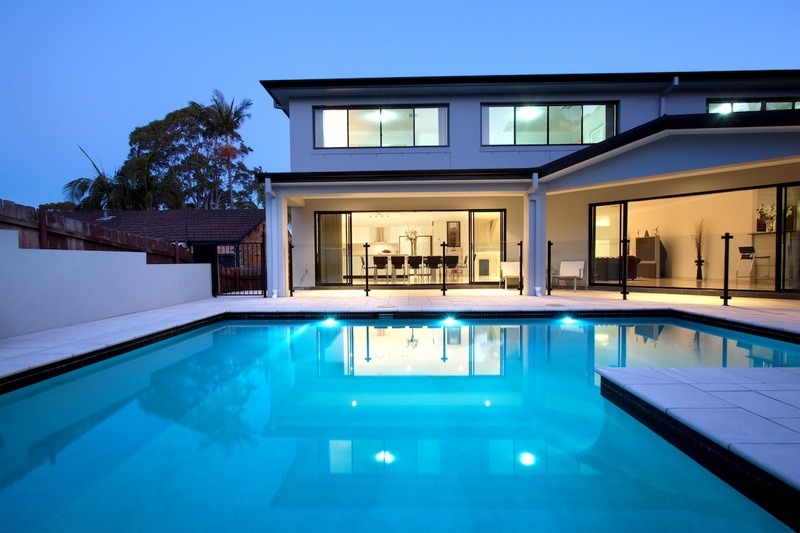 Beyond the visible, Sunset Pools are renowned for incorporating and concealing the most advanced and efficient water filtration, heating, safety accessories and quality lighting technology within their designer pools. Your Sunset renovated pool with upgraded filtration, heating and water management systems will be far more efficient and will require less time, effort and resources to operate for many more years to come. This bespoke ‘L’ shaped configuration is no exception. There are no less that 12 balanced returns to the pool from the automated ‘Hurlcon’ water management equipment, the ionizer natural sanitation system and the ‘Sunbather’ solar heating array. Sunset’s 50mm PN 12 pressure pipe hydraulic design makes certain that the pool always operates a peak performance to minimise maintenance, reduce operating overheads and optimise efficiency. Sunset relies almost exclusively on customer referrals, therefore every aspect of your revitalised pool and spa is meticulously finished. 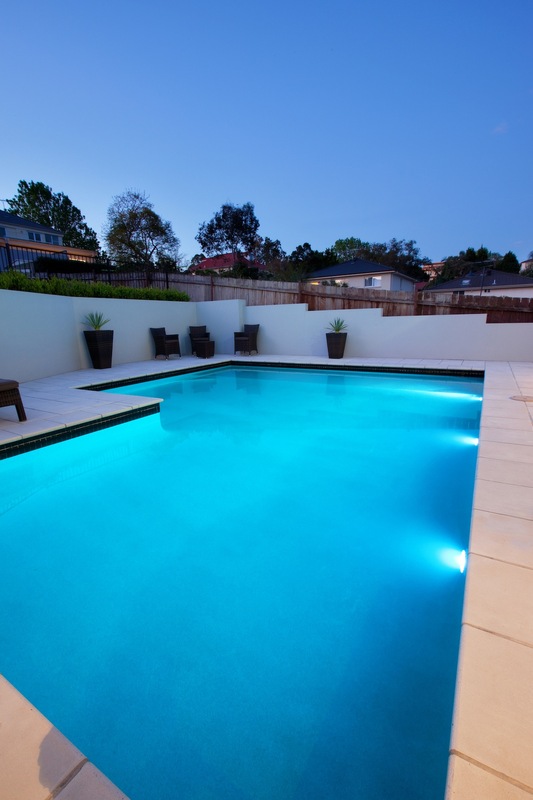 In addition, you can rely on Sunset’s diligent and courteous team to put the sparkle back into your existing pool and spa plus ensure your premises are spotless prior to its completion and commissioning. 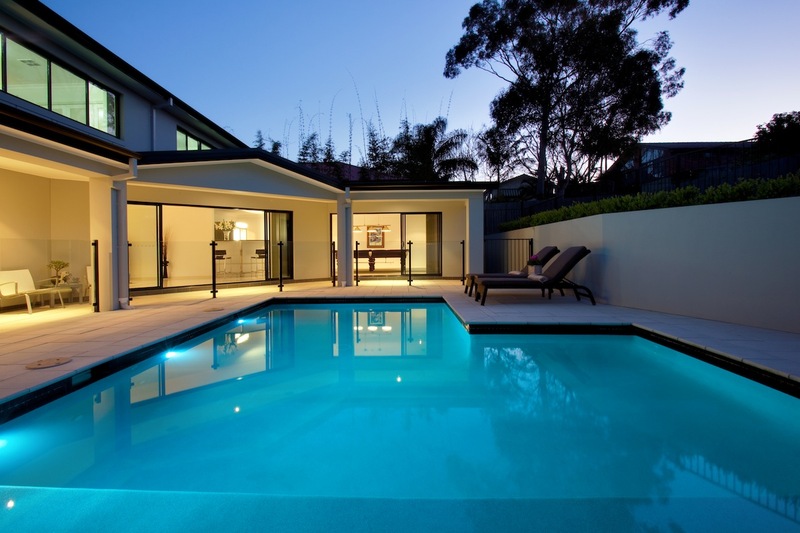 Sunset Pools provide specialised consulting and pool refurbishment services to commercial and government clients in addition to outstanding residential swimming pools and spas. They are renowned for their accurate estimating, sound administration, safe work practices and having all the required licences and insurance. When your pool or spa no longer reflects your sense of style, determine how a quality Sunset Pools renovation will replace, update or restore your aging asset. Telephone Sunset on 1300 000 412 or complete the enquiry form today.